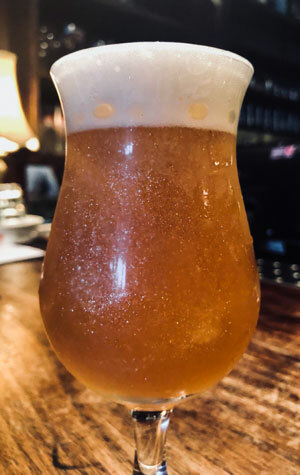 If you're a frequenter of the online elements of the craft beer world, you may well already be acquainted with this beer from Two Birds Brewing. It's the first release from their new pilot system and it's an IPA they've looked to pack full of tropical, pineapple and pine characters. All of which is well and good, but not why you'll likely have come across it. No, the main reason is that it's a beer that glitters thanks to the addition of, well, glitter. While little is off bounds to brewers these days, you may wonder what possessed them to do such a thing (other than it allowing them to create a video that almost broke the internet when they posted it). Yet there is indeed method in the madness: it's a tribute to one of Two Birds founder Jayne Lewis' heroes, David Bowie. Brewed in the week of his birth, two years on from his death and inspired by his Ziggy Stardust character, it's a beer that pays suitable homage to one of the great chameleonic artists of the past century, someone who managed to turn even his passing into a work of art, unexpectedly dropping one of the best albums of his career just as the last of his life force was draining. For anyone keen to try it and worried about a mouthful of glitter, fear not as it's a natural mineral often used in food. As for the more prosaic ingredients, it's local malt from Voyager and suitably Starman-esque hops in the shape of Southern Cross, Galaxy, Comet and Equinox, added in enough quantities to deliver 69 International Bitterness Units, Bowie's age when he died.